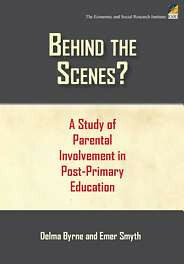 A comprehensive look at the involvement of parents in post-primary education. Parents are the main source of advice as young people make choices about what subjects to take, which programmes to select, and even whether to remain in school or not. Many young people in second-level education still rely on their parents for help with homework and study. But we know very little about parents' own perspectives. This book looks at how parents choose schools for their children. It examines whether they are happy with their children's schooling and satisfied with the kind of information they receive on key educational decisions. This book provides unique insights into parents' involvement in their children's education and the information flow between school and home. It highlights important issues for policy, suggesting ways to support the parental role and thus enhance student choices and outcomes. Behind the Scenes will be of interest to parents themselves, policymakers, teacher educators, school management, teachers and the wider academic community.